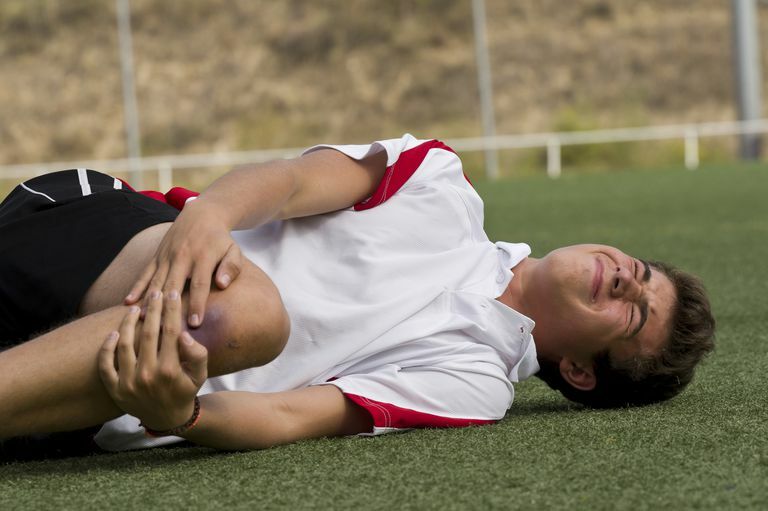 Knee injuries are common in kids who play sports, including ligament injuries and sprains. And these types of injuries, especially if a child can't walk or the knee is unstable, can be serious. This is often why parents bring their children to their pediatrician when they have knee pain. Osgood-Schlatter disease is also a common cause of knee pain, but unlike sprains and other injuries, it is usually not very serious and has few long-term effects. Children with Osgood-Schlatter disease have a tender, swollen bump just under their kneecap on the tibial tuberosity. Although usually just on one knee, it can affect both knees. Unlike other problems that cause knee pain, children with Osgood-Schlatter disease often just have pain during specific activities, such as running, kneeling, jumping, squatting, and climbing stairs. Prolonged sitting might also cause pain, although affected children can usually walk normally without pain or a limp. This is in contrast to a fracture or knee sprain, when any activity, even walking, will likely hurt and cause you to limp. Although X-rays can be done, Osgood-Schlatter disease is usually diagnosed based on the classic history of a young teen having a painful bump over their tibial tuberosity, with pain that is worse with activities. Other more serious conditions that might also cause a painful lump in this area, like a tumor, infection or fracture, would likely also cause pain when your child was at rest or simply walking. The main treatments are symptomatic, including nonsteroidal anti-inflammatory drugs, such as ibuprofen, rest, and putting ice on the area after playing sports. Although rest can be important, especially avoiding those activities that make the pain worse, how much your child stays out of activities really depends on how bad the pain is. If he is able to jog, run and play sports without limping and without a lot of pain, then he may be able to continue his usual activities. If he has severe pain or is limping during his activities, then a few weeks or months of rest might be necessary. At the very least, your child should avoid those activities that cause a lot of pain, especially those that involve a lot of jumping, squatting or kneeling - a type of relative rest. If it doesn't hurt too much, your child can play through the pain when he has Osgood-Schlatter disease. A patellar knee brace or tendon strap might also be helpful. For kids with Osgood-Schlatter disease, the best choice is usually one with a knee strap placed below the kneecap. A contoured knee pad that provides protection to the painful area might also help. Occasionally, for severe cases, a knee immobilizer is needed.​ Surgery is rarely needed. Osgood-Schlatter disease usually begins during a period of active growth (growth spurt) in children between the ages of 10 and 15 years who are active in sports. Although once thought to affect mainly boys, as more girls participate in sports, Osgood-Schlatter disease is being increasingly seen in girls too. Girls do usually seem to be younger when their symptoms start, at 10-11 years, versus 13-14 years for boys. This is likely because girls usually go through their growth spurt before boys. Osgood-Schlatter disease is thought to be caused by chronic microtrauma and it is considered an overuse disorder. Symptoms usually last about 12-18 months, with a non-tender bump lingering in many children. Calf, quadriceps (front of the thigh), and hamstring (back of the thigh) stretching and strengthening exercises might help prevent Osgood-Schlatter disease from developing and can help as part as a part of rehab with a physical therapy protocol. Proper early diagnosis can help prevent unnecessary testing and treatments. Sinding-Larsen-Johansson disease or jumper's knee is a similar condition, but the pain is usually over the lower part of the kneecap and not below the kneecap as it is in Osgood-Schlatter disease. And if your child has Osgood-Schlatter disease, you should probably be on the watch for similar conditions like Sever's disease, especially if they don't have it already. Is your child playing multiple sports at the same time or is he on multiple teams of the same sport? Does he have practice every day or never take a break through the year? These are the kinds of things that put kids at risk for overuse disorders. Being active, getting exercise, and playing sports is great—just don't overdo it. Smith, Angela D. Osgood-Schlatter Disorder and Related Extensor Mechanism Problems. The Pediatric and Adolescent Knee, 2006. Watanabe et al. Sever's disease is one of the factors associated with the onset of Osgood-Schlatter disease in Japanese elementary soccer players. Journal of Science and Medicine in Sport, Volume 18, Supplement 1, December 2014, Page e19. Which Kids Have Restrictions and Shoudn't Play Sports?